Save Our State Forests & Parks! by advocating and enforcing their rights to a clean environment. Over the years, PEDF has been involved in much litigation and success. like the continued impacts of leasing State land for natural gas extraction. that do not protect and conserve those State lands. 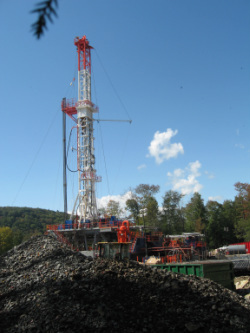 Since the start of the Marcellus Shale leasing program in 2008, $383,000,000 have been siphoned from the OGLF by the governor and the State Legislature to pay down the State's general budget deficit, without the proper authority. And now our elected officials want to transfer more. To establish a bona fide trust fund for future restoration of State lands impacted by oil and gas extraction. PEDF's case is strong and right. We must have the funds to see this through. Copyright 2013 by PEDF. All rights reserved.